Cheese is a dairy product made from the milk of cows, goats, sheep, and other mammals. It is made by coagulating the milk to produce curds (solids) and whey (liquid). The curds are then separated from the whey so they can be processed and matured to produce a wide variety of cheeses. 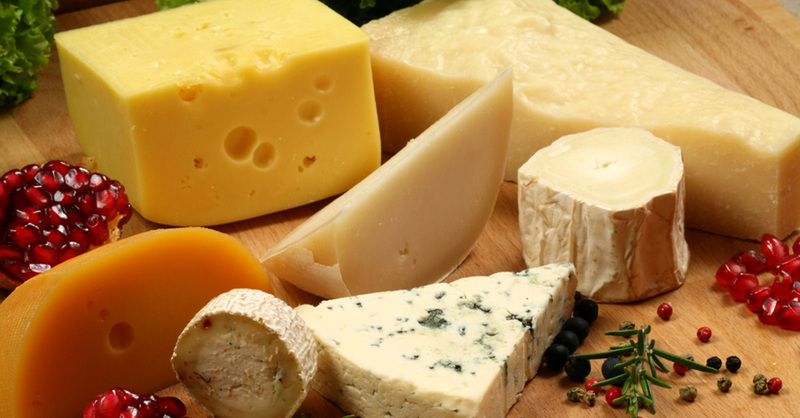 There are over 500 different varieties of cheese produced around the world, including Blue, Cheddar, Cottage, Colby, Swiss, Parmesan, and Mozzarella cheese. The type of cheese produced depends on the milk used and its making process. The milk used may be full fat, low-fat, or fat free milk, or combination of these milks. Cheese is one of the most versatile foods that can be prepared in a variety of ways. It can be baked, melted, cubed, grated, crumbled, and sliced, so is excellent for using in a wide variety of cooked dishes. Apart from being used in variety of dishes, cheese also contains many essential nutrients, like protein, calcium, zinc, and vitamin B12, which can promote good health and prevent diseases. The following are some health benefits of cheese. Cheese contains substances called Conjugated Linoleic Acid (CLA) that help prevent cancer. In addition the B vitamins in cheese also helps protect the body from diseases. If you are trying to gain weight, whether it’s muscle weight, fat or bone density, cheese is the healthy way to go. Cheese is packed with protein, fat, and calcium that keep muscles and bones strong and healthy. Cheese is an excellent source of calcium which is essential for maintaining healthy and strong bones. In addition, the vitamin B in cheese helps the body absorb and distribute calcium. Since cheese is rich in calcium, it can help prevent osteoporosis, a condition in which bones become weak, resulting from lack of calcium. Cheese stimulates saliva production in the mouth which helps to clear away food particles, thus keeping your teeth and mouth clean. Additionally, the casein present in cheese helps to protect tooth enamel by forming a thin film on the tooth surface which prevents tooth decay. Being rich in B vitamins, cheese is very beneficial for the skin. It helps in the growth of cells, making the skin to glow and remove blemishes, resulting in healthy skin. Cheese also contains vitamin A, which plays a vital role in maintaining normal vision. Certain types of cheese, such as Blue, Swiss, and Cheddar cheese, are packed with selenium, an antioxidant which plays an important role in the immune system. Additionally, the B vitamins in the cheese help maintain body functions and boosts immunity. While cheese is a nutritious food that’s packed with many vitamins and minerals, but it’s also high in saturated fat and salt, which can contribute to heart attack and stroke. Therefore, it should be taken in moderation as part of a healthy balanced diet. For optimal health benefits, choose those labeled ‘low-fat’ or ‘fat-free’.